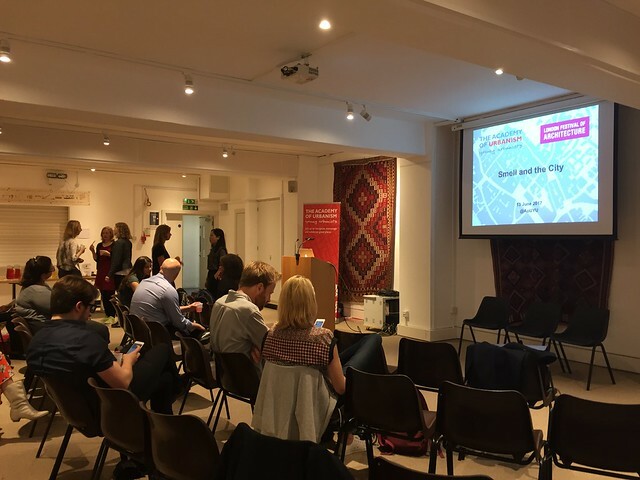 Many thanks to Young Urbanists Chloe McFarlane for the event summary and Gözde Uyar for creating the wonderful Smell Map of London as well as the taking the photos posted on our Flickr page. On Tuesday 13 June 2017, the Young Urbanists held an event as part of the London Festival of Architecture whose theme for 2017 was Memory. Over the past few years, there has been an increasing amount of research looking into the relationship between smell and memory in relation to the built environment, notably from Victoria Henshaw. The event treated attendees to talks from some of the leading researchers in the field, including Kate McLean from the Royal College of Art, Jieling Xiao from Birmingham City University and Alexandra Gomes from The Bartlett, UCL. The first speaker of the event was Jieling Xiao. Upon her arrival to the stage, she sprayed two different scents into the air – one which smelt of “wet garden” and the other, “sunshine”. She went on to explain how everyone associates the smells with different (negative or conversely positive) memories. In 2016, she conducted a study examining the smellscape of two intermodal transit spaces: Sheffield Railway Station and Bus Interchange and Wuchang Railway Transit Centre, situated in the UK and China, respectively. The investigation found that the urban design of intermodal transit spaces can heavily influence the pleasantness of a place. On screen, she revealed the configuration of the Wuchang Railway Transit Centre. The design notably is quite compact. Jieling expressed implications of this and more so how some uses conflicted. For example, public toilets are situated in the middle of the main square, with fans emptying ventilated air into the surroundings. Concluding her session, she expressed how various design interventions (at a macro, midi or micro level) can be undertaken to ensure that people can comfortably linger around major (and increasingly mixed- use) transport hub spaces. Measures (some behavioural) include indoor scenting and public smoking control. Entering from a different angle, Alexandra Gomes argued that the positive role of smell has been downplayed throughout time. Backing her case, she referred to sources dating from Victorian era and the Great London Smog which portrayed smell in a negative light… somewhat as a pollutant detrimental to human health. Alexandra stressed how the urban environment is multi sensory, but how 21st century urban policy seeks to sanitise or “reject” this sense. Recently, she undertook a study analysing smells within the mixed-use London Bishopsgate area. Conducting interviews, a wide array of smells (some appreciated; others detested) were documented by the public. Some further specified their geography and intensity. To end, Alexandra highlighted that to enhance the visibility of smell, it is critical that awareness is raised. There also needs to be acknowledgement in its role, undeniably, in placemaking. The last speaker of the night was Kate McLean who introduced herself as an “accidental urbanist”. Compared to the other speakers, she placed heavy emphasis on the dynamic dimension of smell, moreso seeing it as an “activity”. Facilitating numerous smell walking tours in European cities such as Paris and Amsterdam, she proudly mentioned that “humans are the data source for her work”. During such tours, she would ask participants “If you could see a smell, what would it look like…?”. Prominently during her talk, she accentuated the temporal nature of smell and how, in the future, animated maps could be created to illustrate the real-time diffusion of various smells throughout cityscapes. See the photos from this event on the Academy’s Flickr page here (click on image below). 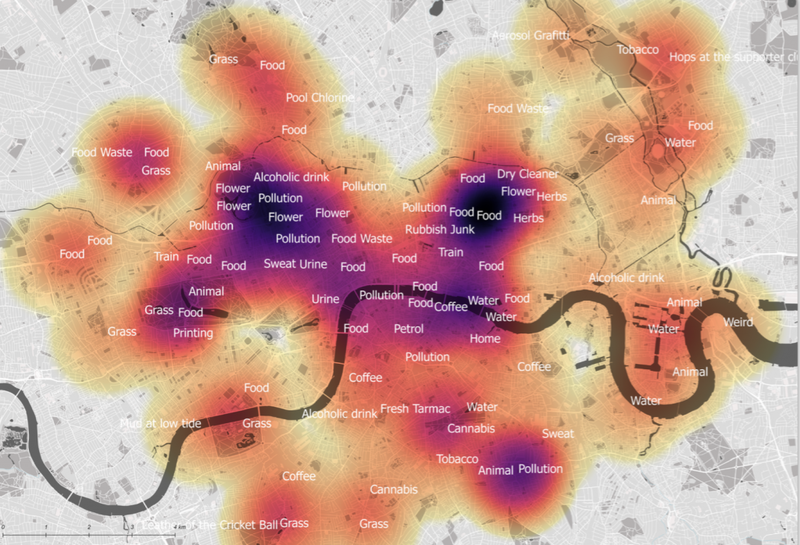 Check out the fantastic Smell Map of London that was created based on attendees memories of different smells (good and bad) around London. Many thanks to Gözde Uyar for her hard work on pulling this together.